You are currently browsing the category archive for the ‘african american’ category. This weekend, the two Democratic front runners went head to head competing for black voters’ hearts and minds in Selma, Alabama. Hillary was armed with her husband and Obama was armed with his melanin, and the two duked it out in what can only be described as a dignified, civil discourse of ideas and perspectives. The two candidates treated each other with respect, singing their individual praises, and welcoming them to a sporting campaign whose outcome would benefit America no matter who ended up on top. I’ll be interested to see which one goes back to the usual mudslinging. As that excellent piece by ABC News (click on that link people) explains, Hillary’s only true setback is her charisma, or lack thereof. The stiff stoic-ness may seem more presidential…but it rarely works. These days, you have to be both a stage performer and a political junkie to get anywhere. Regardless, cheers to the candidates for taking the high road this weekend. Obama = Black? Does this even matter? Barrack Obama, or “Diet Jesus” as his friends call him, is making some serious headway with black voters at the expense of Mizz Hillary. According to a piece in the Post (the good one), Hillary’s lead among black voters has been “sliced in half” in favor of the junior Senator from Illinois. This raises an interesting spectre for the psychology behind Obama. Is he truly black or is he “African” and should there even be a distinction? Wait, I know what you’re thinking, this isn’t interesting. Why is it that as soon as a viable black candidate appears, people have to immediately deconstruct his racial identity. He can’t really be black, can he? Because he hasn’t shared in the strife of the black experience, he’s an American African, not an African-American. This is complete and utter nonsense. Racism by its very nature lacks any reason or sense, it is based entirely on the color of one’s skin or the ethnicity from which one originates. Because of the color of his skin, Obama has been subject to the same reduced set of expectations as that of the entire African-American community and he has shattered them completely and utterly. Perhaps it’s time to look at the content of his character. Being a Puerto Rican man who looks nothing like the average Boricua, I’m on the opposite end of this argument. Because I don’t look Hispanic, I have benefited from a society that for all its rhetoric about cherishing different cultures is actively and unjustly hostile to the Latino community. I’ve seen first hand how an ultra-modern republic can still be so swayed by our primitive instinct of fortifying communities made up of people that look alike. From my personal experiences, a Latino is a Latino, regardless of whether he or she is from Mexico, Honduras, or Michigan. Sure, many people think Cubans and their deadly Republicanism are annoying, but they are still our brothers and sisters, we love them just the same. My black friends, however, see themselves as having an entirely different identity from even the second and third generation Haitian and Jamaican people they know. They simply aren’t black according to them. My criticism is thus, how can these communities celebrate the entrance of a viable minority candidate while simultaneously picking his identity to pieces? 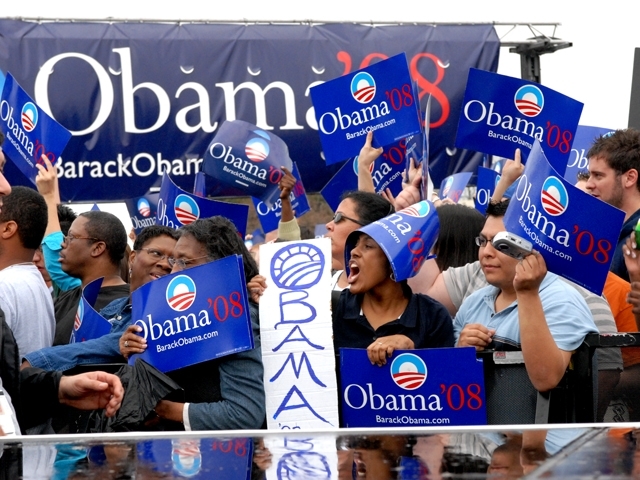 There is nothing wrong with an Afro-Centric perspective and point of view on the candidacy of Barack Obama. What I believe is inherently wrong, however, is how a surprising percentage of the community’s intellectual backbone is holding the man at arms length while he so clearly better represents their interests.